This app allows you to play good old NES ( Nintendo Entertainment System, aka. 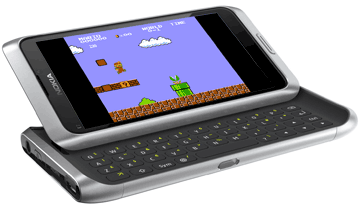 Famicom in Asia ) roms on your Nokia smartphone ( Symbian s60v3 FP1&2 only ), just like on your PC with NES emulator software. Remember such titles like Super Mario Bros, Battle City, Pac Man and many more. This emulator allows you to play almost all those roms, that you can find on the net, and there are more than thousand available for downloads! Both - video and audio are perfect. It is even possible to connect your phone to your TV set using video/audio-out cable ( if handset supports it ), and enjoy full-size gaming. Please notice, that those ROMs are objects of copyright laws, so you should download them, only if you already own cartrige of exact game. This NES emulator also has one major advantage against other available mobile NES emulators ( like Vampent's vNES ) - it is FREE. And there is no need for hacking your phone's software to install it. Download gpfce_0.3.2 s60v3.sis file, transfer ir to your phone using file transfer mode or nokia pc suite - it is up to you. Run it, and install it to phone memory or memory card. You must transfer your .rom files to your device as well ( doesn't matter, in which directory ). And thats it! You're ready to go. Run GPFce. Press C key ( pencil key for Eseries ) for the main menu. Then go to "Load new ROM", and browse your rom files, wherever you've placed them. After that you can configure key mappings, save any state, load it, and adjust many more settings. Download for free gpfce_0.3.2.s60v3.sis - mobile NES emulator ( 230 KB )! where can i have the .rom files please can anyone give me a link? i downloaded emulator for gameboy,plus zip file for the game but after installing amd opening the gpfc emulator i dont know how to run the game. Too bad doesn't work on my 5800 xpressmusic! !